Protection is better than cure and what better way to protect your health and nourish your body than to include fresh green grasses in your daily regimen? 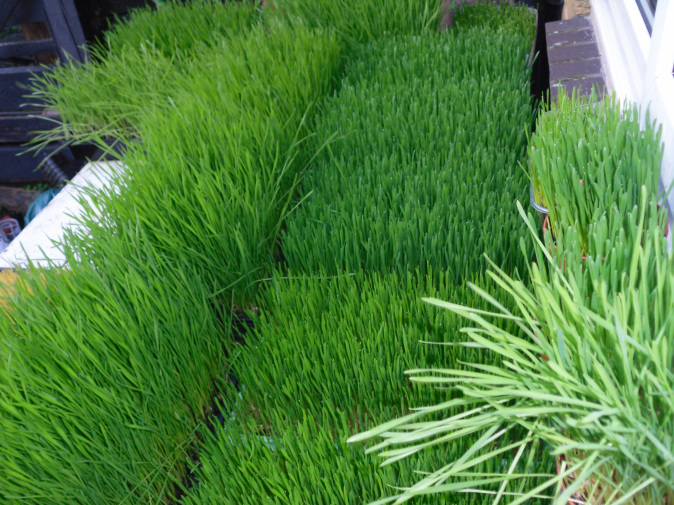 One of the popular green grasses is wheatgrass. Wheatgrass is an amazing plant. It makes one of the most nourishing fresh juices, bursting with vitamins, minerals, live enzymes, phytonutrients, natural sugars, amino acids and etc . And what is remarkable is that growing wheatgrass can be fan. When I started growing wheatgrass for our consumption, I never realized that it would infiltrate my life as it has. I learnt about its benefits in 1999 when I came to USA and found my son with a wheatgrass juicer. He was juicing cut wheatgrass from Whole Foods. I would take a short on and off because it was too expensive. In fact, due to its high cost we ended up storing away the juicer and we settled for spirulina and wheatgrass powder instead. Can you imagine that I just started growing wheatgrass last year? 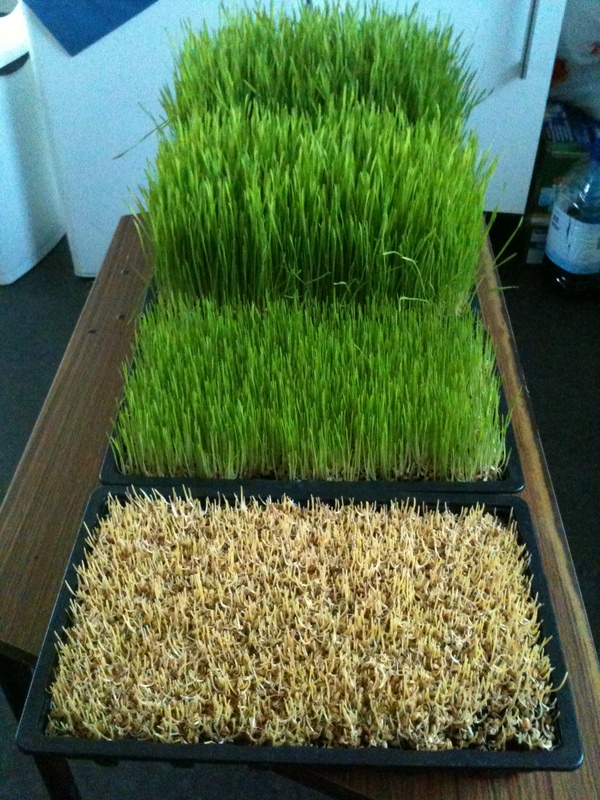 For years, I contemplated growing wheatgrass but I kept putting off as I was intimidated by the whole idea. I thought it was too delicate and too complicated to handle until my sister Cate, who lives in UK was diagnosed with stage 4 esophagus cancer, in September 2012. After the initial shock and panic we had no alternative but to face the challenge head on, in order to help her fight the cancer and the side effects of chemotherapy. One of the steps we took was growing wheatgrass and I must say, this is one of the most exciting and satisfying things I have ever done. Wash the wheatgrass berries thoroughly to get rid of any dust. Then drain out all the water. You can use the sprouting set if you have it but I use plastic measuring jug to wash and I use a strainer to drain the berries. 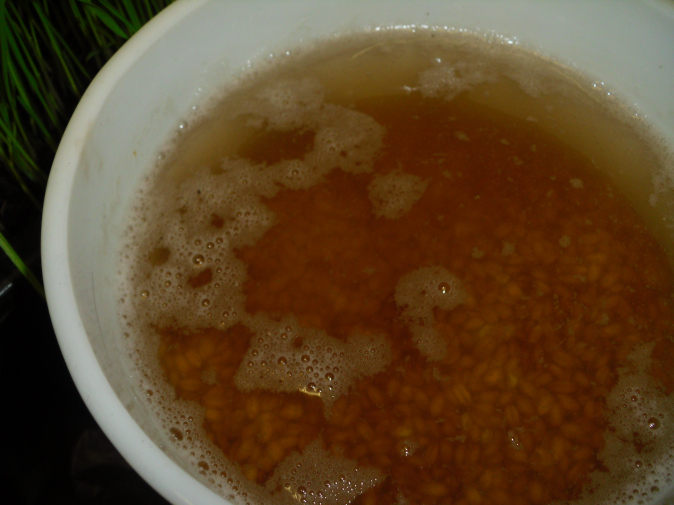 Soak wheat berries: by adding twice as much water of the level of the berries. Turn around or stir the seeds so they all get equal contact with the water. I soak my berries in a dish or bowl but the sprouting set is normally used. After 12 hours, drain out the water and wash, drain and cover with a damp clean cloth or towel and leave in a dark place. After 24 hours, the berries are sprouted when you see short tails and are ready to sow. 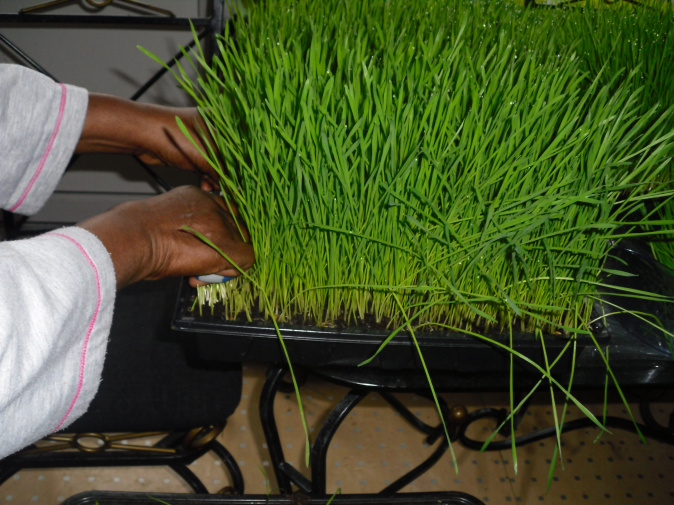 Prepare the medium to grow your wheat grass. Presently, I prefer growing wheatgrass in plant organic potting soil for fruits and vegetables +, than hydroponically (using other medium like baby blankets, STG mats) Do not fill the tray to the brim with soil. At least leave 1/2 inch or so at the top without soil. 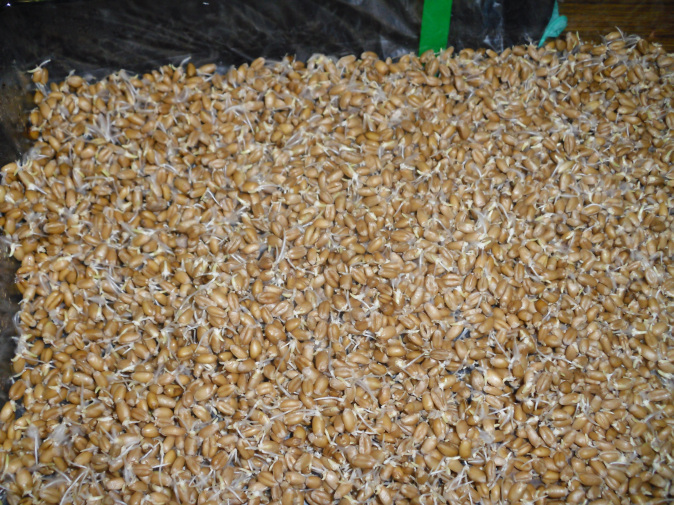 Spread the sprouted wheat berries on top of the soil so that there are no spaces between the seeds. My tray looks like a carpet but some people recommend lighter planting. . 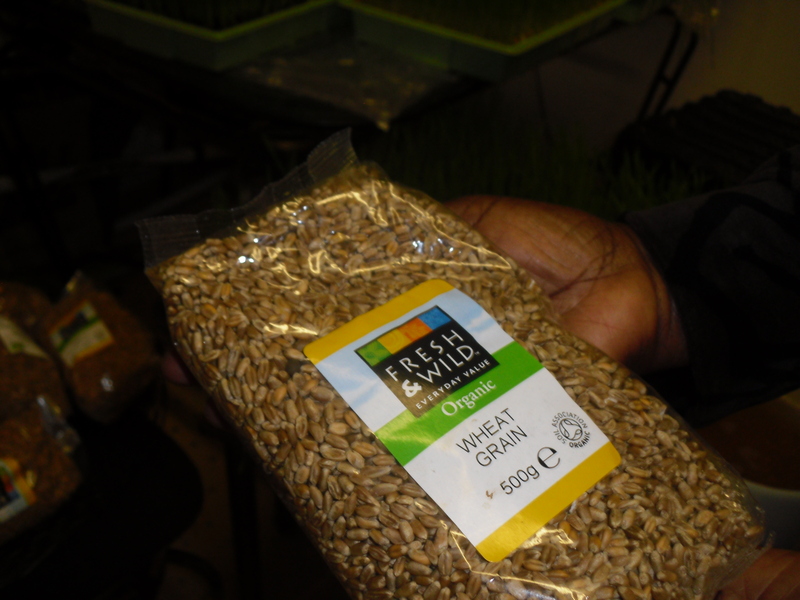 When we first started growing wheatgrass we used to space the seeds out and we were very disappointed with the yield. We would get just a few ounces from a tray but now we get a real yield 10 oz. 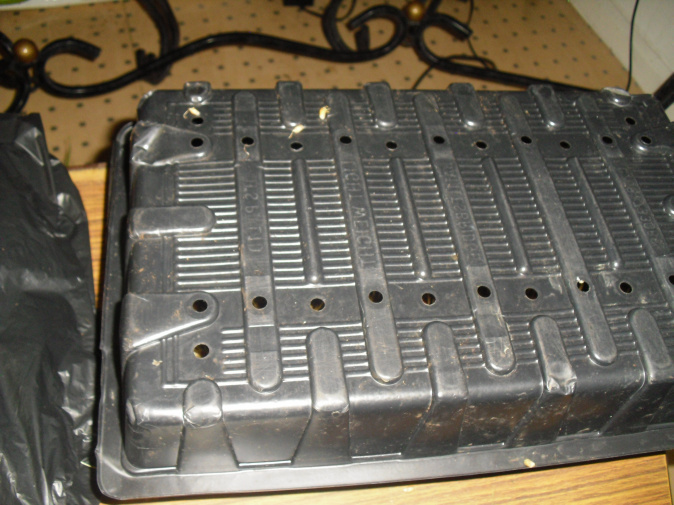 – 16oz..
Water the tray with the prepared fertilizer solution and then cover the seed with a tray to keep them from drying and to keep the light out. For the next 3 – 4 days of growth, water well once a day in the morning but do not flood. Then lightly sprinkle some water over your seed in the evening, always covering after watering. When the grass starts forking (branching or bringing another blade like a fork) it is ready to harvest, between 7-10 inches. Don’t let it grow too high as the grain may start growing leading to less nutrients in the grass and also the formation of gluten. Cut ½ an inch above the soil to avoid contamination. I do not make a second harvest but if you want to harvest twice from a tray you may cut a bit higher to give your grass a better start. Repeat the daily watering of the grass for another 7 to 8 days and re-harvest. 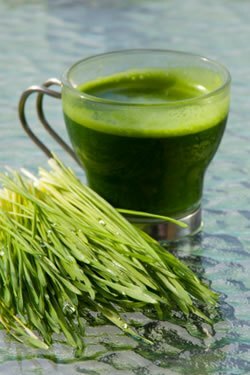 Wheatgrass is most potent when taken neat but if you cannot stand the smell and the taste you can mix it with a little fresh vegetable juice or freshly juiced organic apple juice. Avoid mixing it with citric juices or acidic fruit juices. A normal short is 2 ounces once or twice a day. This is just one of the many live juices overflowing with vitamins, minerals, live enzymes, phytonutrients, natural sugars, amino acids and etc. that are essential for protecting our health. Many people say they can’t afford juicing or incorporating more live foods in their lifestyle. I can understand that, I have been there. It is a fact that these foods are expensive but their benefits outweigh the expense. That was one of the reasons we decided to grow our own wheatgrass. If you try hard enough, you will find other ways of reducing the cost. Buying what is in season, buying directly from farmers or from farmers’ markets, buying in bulk, looking for bargains from health stores; are some ways which may help you save a bit of money. Every time I go to Whole Foods Market I find some type of bargain. During the past few months, we have managed to buy a different type of organic apples on sale each week. Another step you should take is to eliminate the junk and stop the dependence on fast foods, and also reduce eating out. That money should then be used for potent foods. You will be surprised how these live foods make you feel, especially when you juice. Juicing is energizing, revitalizing, uplifting and filling. When you use quality fruits and vegetables, pure food goes directly into the body without needing much digestion. I hope you give it a try. It is worth it.